Basement Strippers are a 4-piece Alternative Rock band from Bedfordshire, UK. 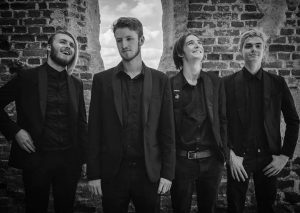 They are formed of Jamie Gilman-Lewis (lead vocals, bass guitar), Bayley McNamee (guitar, backing vocals), William Gilman-Lewis (keyboards and synths) and Lucas Hammond (drums). After forming in late 2016, The band released their debut EP, The Exotic Show in the summer of 2017. The EP’s main single We Are Not Afraid was featured in motion picture “Dead Squad”. With an exciting future ahead of them, Basement Strippers are storming into the East of England music scene with attitude, style and showmanship of the highest calibre.